Many soldiers who serve in the United States Military have experiences which are traumatic and have a profound effect on their life. 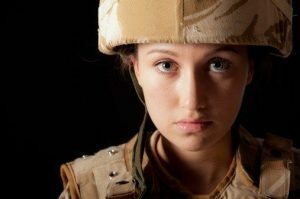 Over the past several decades the military has begun to formally recognize how debilitating the symptoms of post-traumatic stress disorder (PTSD) can be. However, simply being diagnosed with PTSD is not an automatic guarantee of being granted disability benefits and such claims are frequently denied. Our federal employment attorneys have the experience necessary to assist veterans in appealing the VA’s decision if they have been denied full disability benefits with regards to their PTSD condition. If you have been denied disability benefits, you may have a good chance of winning your request on appeal. Contact our lawyers today for a free case consultation. When the VA denies benefits then the denial can be appealed by filing a “Notice of Disagreement.” It is common for veterans to have under-reported their symptoms and the Notice of Disagreement can be used to paint a fuller picture. An attorney can assist with the Disagreement process. Our attorneys are able to assist veterans in filing their Notice of Disagreement after their PTSD claim has been denied. We will work to document one’s condition in a way which explains how their symptoms prevent them from gaining steady work. Appealing the VA’s decision can be a long and tedious process and our attorneys will ensure that the process continues to move through the system and does not get lost in the shuffle. For veterans who are homeless or are in danger of becoming homeless, we may be able to expedite the process. If the VA has denied providing full benefits for a PTSD related condition that does not mean hope is lost. Contact our office today. We service clients in all fifty states as well as the greater Atlanta Metro area including Macon, Savannah, Athens, Kennesaw, Marietta, Decatur, Dunwoody, Stone Mountain, Tucker, Alpharetta, Roswell, Sandy Springs, Duluth, Lawrenceville, Lilburn, Norcross, Gainesville, as well as the counties of Bibb, Chatham, Clarke, Cobb, DeKalb, Fulton, Gwinnett, and Richmond. The attorneys at Obiorah Fields, LLC have dedicated their careers to helping veterans win the disability benefits they deserve. Based in the Atlanta metro area, our lawyers represent clients both in Georgia and throughout the United States. We conduct both in person and phone consultations and can file most documentation electronically. When necessary to represent a client during an official hearing we will travel. Our attorneys always charge an affordable rate, and all fees are on contingent of winning benefits for our veterans. Call our office today for a free case consultation.